We demonstrate Meep's near-to-far field transformation feature using two examples. There are three steps involved in this type of calculation. First, we need to define the "near" surface(s) as a set of surfaces capturing all outgoing radiation in the desired direction(s). Second, we run the simulation using a pulsed source (or alternatively, a CW source via the frequency-domain solver) to allow Meep to accumulate the Fourier transforms on the near surface(s). Third, we have Meep compute the far fields at any desired points with the option to save the far fields to an HDF5 file. In this example, we compute the radiation pattern of an antenna. This involves an electric-current point dipole source as the emitter in vacuum. The source is placed at the center of a 2d square cell surrounded by PML. 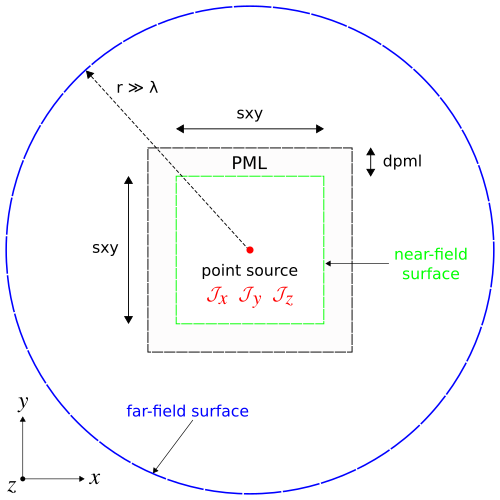 The near fields are obtained on a bounding box defined along the edges of the non-PML region. The far fields are computed in two ways: along the (1) sides of a square box and (2) circumference of a circle, having a length/radius many times larger than the source wavelength and lying beyond the cell. From both the near and far fields, we will also compute the total outgoing Poynting flux and demonstrate that they are equivalent. Results will be shown for three orthogonal polarizations of the input source. The simulation geometry is shown in the following schematic. In the first part of the simulation, we define the cell and sources as well as the near field and flux regions. Since we are using a pulsed source (with center wavelength of 1 μm), the fields are timestepped until they have sufficiently decayed away. In the first of two cases, the flux of the far fields is computed using the flux routine for a square box of side length 2 mm which is 2000 times larger than the source wavelength. This requires computing the outgoing flux on each of the four sides of the box separately and summing the values. The resolution of the far fields is chosen arbitrarily as 1 point/μm. This means there are 2x106 points per side length. For the second of two cases, we use the get_farfield routine to compute the far fields by looping over a set of 100 equally-spaced points along the circumference of a circle with radius of 1 mm. The six far field components (E, E, E, H, H, H) are stored as separate arrays of complex numbers. From the far fields at each point , we compute the outgoing or radial flux: , where P and P are the components of the Poynting vector . Note that is always 0 since this is a 2d simulation. The total flux is computed and the three flux values are displayed. By Poynting's theorem, the total outgoing flux obtained by integrating around a closed surface should be the same whether it is calculated from the near or far fields (unless there are sources or absorbers in between). The flux of the near fields for the J source is 2.456196 and that for the far fields is 2.458030 (box) and 2.457249 (circle). The ratio of near- to far-field (circle) flux is 0.999571. Similarly, for the J source, the values are 1.227786 (near-field), 1.227651 (far-field box), and 1.227260 (far-field circle). The ratio of near- to far-field (circle) flux is 1.000429. The slight differences in the flux values are due to discretization effects and will decrease as the resolution is increased. Finally, we plot the radial flux normalized by its maximum value over the entire interval to obtain a range of values between 0 and 1. These are shown below in the linearly-scaled, polar-coordinate plots. The three figures are obtained using separate runs involving a src_cmpt of E, E, and E. As expected, the J and J sources produce dipole radiation patterns while J has a monopole pattern. This example demonstrates how to compute the far-field profile at the focal length of a metasurface lens. The lens design, which is also part of the tutorial, is based on a supercell of binary-grating unit cells. For a review of the binary-grating geometry as well as a demonstration of computing its phasemap, see Tutorial/Mode Decomposition. The far-field calculation of the lens contains two separate components: (1) compute the phasemap of the unit cell as a function of a single geometric parameter, the duty cycle, while keeping its height and periodicity fixed (1.8 and 0.3 μm), and (2) form the supercell lens by tuning the local phase of each of a variable number of unit cells according to the quadratic formula for planar wavefront focusing. The design wavelength is 0.5 μm and the focal length is 0.2 mm. The input source is an Ez-polarized planewave at normal incidence. The key to the script is the function grating with three geometric input arguments (periodicity, height, and list of duty cycles) which performs the two main tasks: (1) for a unit cell, it computes the phase (as well as the transmittance) and then translates this value from the range of [-π,π] of Mode Decomposition to [-2π,0] in order to be consistent with the analytic formula for the local phase and (2) for a supercell, it computes the far-field intensity profile around the focal length of the lens. 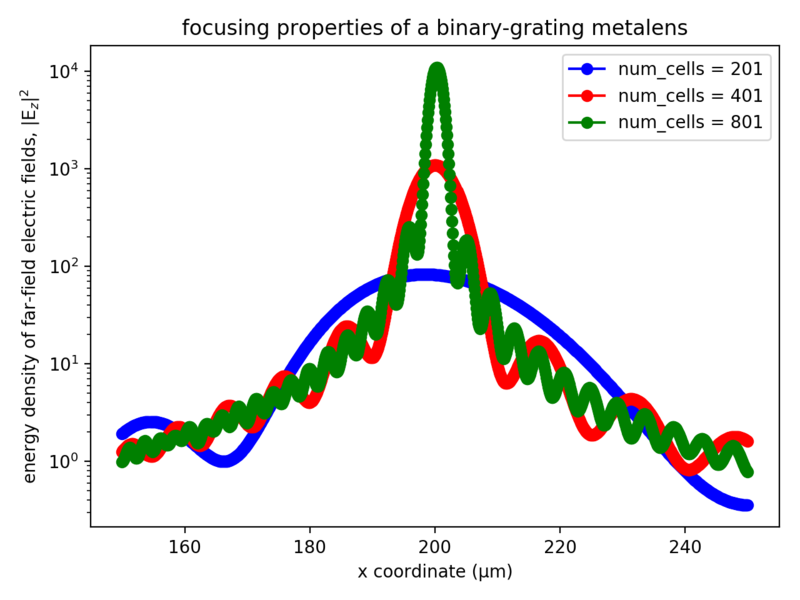 In the first of two parts of the calculation, a phasemap of the binary-grating unit cell is generated based on varying the duty cycle from 0.1 to 0.9. The phasemap is shown below. 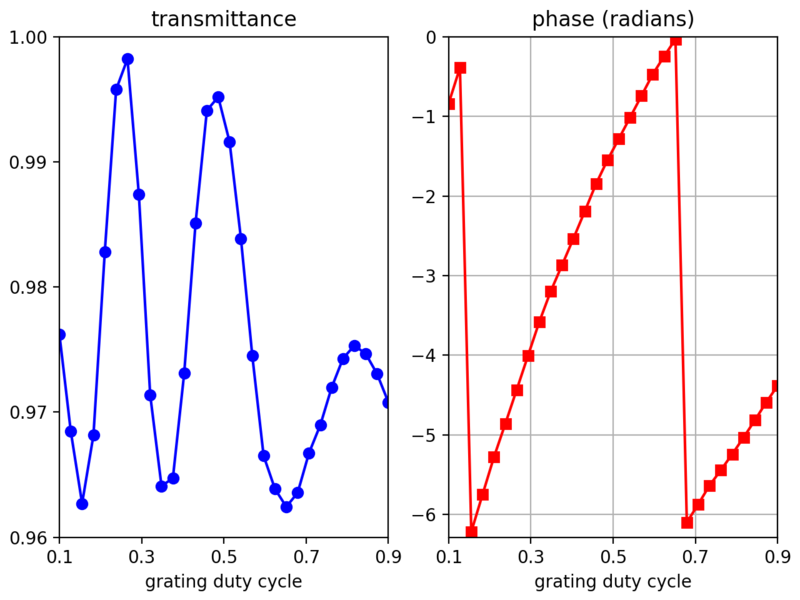 The left figure shows the transmittance which is nearly unity for all values of the duty cycle. This is expected since the periodicity is subwavelength. The right figure shows the phase. There is a subregion in the middle of the plot spanning the duty-cycle range of roughly 0.16 to 0.65 in which the phase varies continuously over the full range of -2π to 0. This structural regime is used to design the supercell lens. In the second part of the calculation, the far-field energy-density profile of three supercell lens designs, comprised of 201, 401, and 801 unit cells, are computed using the quadratic formula for the local phase. Initially, this involves fitting the unit-cell phase data to a finer duty-cycle grid in order to enhance the local-phase interpolation of the supercell. This is important since as the number of unit cells in the lens increases, the local phase via the duty cycle varies more gradually from unit cell to unit cell. However, if the duty cycle becomes too gradual (i.e., less than a tenth of the pixel dimensions), the resolution may also need to be increased in order to improve the accuracy of subpixel smoothing. Shown below is the supercell lens design involving 201 unit cells. Note that even though periodic boundaries are used in the supercell calculation (via the k_point), the choice of cell boundaries in the y (or longitudinal) direction is irrelevant given the finite length of the lens. For example, PMLs could also have been used (at the expense of a larger cell). Although add_near2far does support periodic boundaries (via the nperiods parameter), it is not necessary for this particular example. 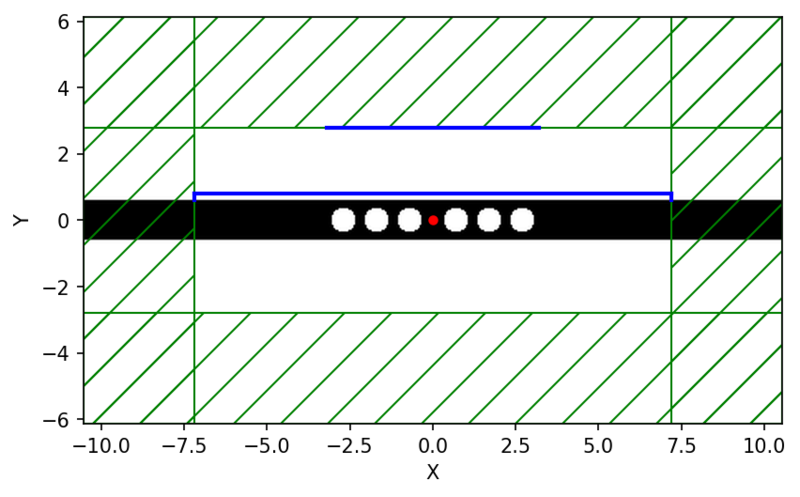 The far-field energy-density profile is shown below for the three lens designs. As the number of unit cells increases, the focal spot becomes sharper and sharper. This is expected since the longer the focal length, the bigger the lens required to demonstrate focusing (which means more unit cells). In this example, the largest lens design contains 801 unit cells which corresponds to 0.24 mm or 1.2X the focal length. For this demonstration, we will compute the far-field spectra of a resonant cavity mode in a holey waveguide; a structure we had explored in Tutorial/Resonant Modes and Transmission in a Waveguide Cavity. The script is in examples/cavity-farfield.py. The notebook is examples/cavity-farfield.ipynb. The structure is shown at the bottom of the left image below. We are creating a "near" bounding surface, consisting of three separate regions surrounding the cavity, that captures all outgoing waves in the top-half of the cell. Note that the x-normal surface on the left has a weight of -1 corresponding to the direction of the outward normal vector relative to the x direction so that the far-field spectra is correctly computed from the outgoing fields, similar to the flux and force features. The parameter d1 is the distance between the edge of the waveguide and the bounding surface, as shown in the schematic above, and we will demonstrate that changing this parameter does not change the far-field spectra which we compute at a single frequency corresponding to the cavity mode. The first item to note is that the far-field region is located outside of the cell, although in principle it can be located anywhere. The second is that the far-field spectra can be interpolated onto a spatial grid that has any given resolution but in this example we used the same resolution as the simulation. Note that the simulation itself used purely real fields but the output, given its analytical nature, contains complex fields. Finally, given that the far-field spectra is derived from the Fourier-transformed fields which includes an arbitrary constant factor, we should expect an overall scale and phase difference in the results obtained using the near-to-far-field feature with those from a corresponding simulation involving the full computational volume. The key point is that the results will be qualitatively but not quantitatively identical. The data will be written out to an HDF5 file having a filename prefix with the values of the three main parameters. This file will includes the far-field spectra for all six field components, including real and imaginary parts. We run the above modified control file and in post-processing create an image of the real and imaginary parts of H over the far-field region which is shown in insets (a) above. For comparison, we compute the steady-state fields using a larger cell that contains within it the far-field region. This involves a continuous source and complex fields. Results are shown in figure (b) above. The difference in the relative phases among any two points within each of the two field spectra is zero, which can be confirmed numerically. Also, as would be expected, it can be shown that increasing d1 does not change the far-field spectra as long as the results are sufficiently converged. This indicates that discretization effects are irrelevant. In general, it is tricky to interpret the overall scale and phase of the far fields, because it is related to the scaling of the Fourier transforms of the near fields. It is simplest to use the near2far feature in situations where the overall scaling is irrelevant, e.g. when you are computing a ratio of fields in two simulations, or a fraction of the far field in some region, etcetera.